When you get a terse email and perceive it as a personal affront, that’s your mindset working. When you feel your defensiveness growing during critique, that’s your mindset working. When you choose to exclude someone from the design process because you think they just don’t get it, that’s your mindset working. Mindset is how I refer to the collection of attitudes and biases that influence the way you see, interpret, and act in a situation. They’re manifested through our behaviors. You understand someone’s mindset, you might be able to explain why they behave the way they do. Mindset became important to me as a manager to help me understand behaviors in colleagues that seemed self-defeating. I saw team members wait until the last minute to ask for help. I saw them ignoring well-articulated tasks and obligations. I saw them defaulting to old habits, even when counseled not to. Why, I wondered, did people do these things? More importantly, why do I keep doing things that I know don’t work, or make things worse? Why do team members do things that seem self-defeating? 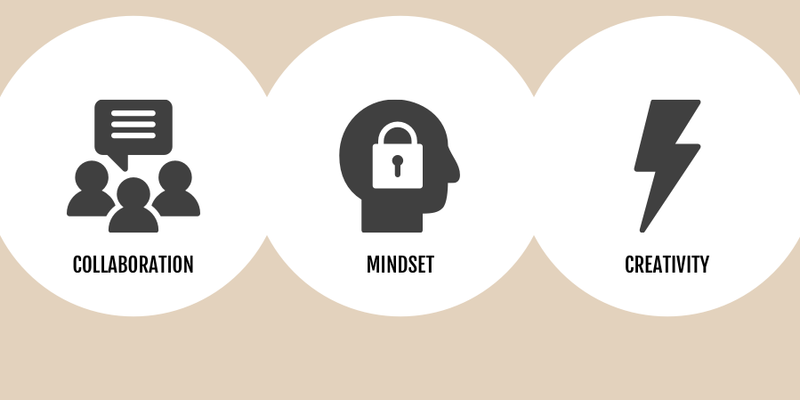 Mindset helps me understand how designers see themselves, their work, and their teams. It explains team member behaviors, and suggests meaningful questions to ask prospective employees. 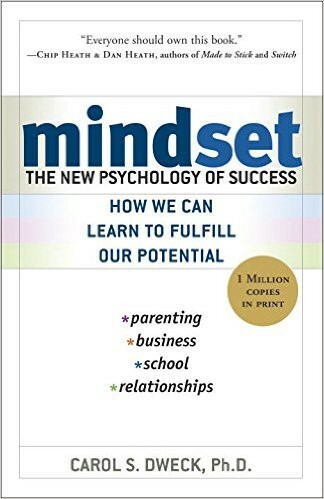 Moreover, mindset offers a structure for me to look at my own behaviors as a teammate, participant, and contributor. The idea didn’t really gel, however, until my partner Nathan pointed me to the work of Carol Dweck. Dweck’s book, Mindset, describes a psychological distinction she discovered in doing research on an otherwise unexplainable behavior. When offered a challenging task, many smart people would choose not to do it. Worried that failure would call into question their intelligence, they chose to avoid the task altogether. Rather than shatter their view of themselves, people with this mindset deflected the challenge. Dweck refers to this as fixed mindset because these people believe their intelligence and abilities are immutable. If abilities are determined at birth, then any failure — no matter how small — reveals flaws. Rather than risk shattering their view of themselves as intelligent, fixed mindset people chose to deflect a challenge. When a team member waits until too late to ask for help, I understand that they see that request as a failure. With a fixed mindset, asking for help is tantamount to admitting they can’t do an assigned task. A team member preoccupied with the tone of direct feedback, and not its content, shows they’re reluctant to reflect on their own work. With a fixed mindset, the urge to deflect any criticism is strong. By contrast, the growth mindset entails understanding challenge as an opportunity to grow, failure as a sign that harder work is necessary. People with a growth mindset understand that individuals have the power to improve their capabilities. Dweck admits that an individual may exhibit both fixed and growth mindsets: we are far too complicated to boil down to a single dimension. There may be some challenges you embrace whole-heartedly (for me, cooking a new meal), and others you resist (practicing guitar). While fixed and growth mindsets shed new light on my world, they don’t explain all the essential behaviors of great designers. As a leader, I need a more practical framework to guide my teammates’ behaviors. As a practicing designer and contributor, I need a more robust language to reflect on my own behaviors. My psychological obstacles are more complex than mere fear of failure. In describing each mindset, I’ll suggest a behavior that best demonstrates it. Designers, as a breed, are genuinely interested in what makes something tick. Creativity–that is, recognizing problems and assembling solutions in new ways–depends on accumulating information. That information is raw material for the cognitive processes that germinate new ideas. Curious behavior: Ask questions. Great designers ask questions because they’re genuinely interested in an industry, or someone’s perspective on an industry. They ask questions because they’re eager to learn more about a new thing, or even someone else’s view of this new thing. Successful designers don’t take anything at face value: they question assumptions. The challenge here is being skeptical of your own work, of your own assumptions. When you do rely on an untested assumption, it’s because you’ve done so consciously, with the understanding that further learning may unseat it. Skeptical behavior: List assumptions. 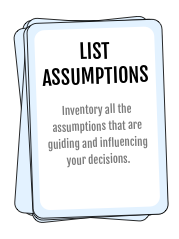 Being skeptical starts with being able to name the assumptions. Great designers take the time to shed light on those assumptions, ensuring they’re aware of things that may be influencing their decisions beyond concrete facts. Being a designer means sometimes adopting a “beginner’s mind,” a cultivated naïveté. Humility serves curiosity because it encourages you to ask more questions about things you might already know about. But humility also serves skepticism in that it discourages you from taking your own preconceptions for granted. Humble behavior: Seek feedback. In being humble, great designers know that their ideas can’t stand on their own. Good ideas turn into great ideas when subjected to rigorous interrogation. Mindset also plays a role in working with other people. Mindset can help you see complex situations more clearly. It can also cause you to react counter-productively to conflict situations. To keep up with all the changes in the industry, designers sometimes have to abandon how they do things. You may have to adapt your current methods to new circumstances. If you limit yourself, you cannot contribute effectively to your team. Adaptation doesn’t always require learning new skills, but instead finding novel ways to apply them. Adaptive behavior: Try a new technique. Even in the most bureaucratic organizations (I used to work for the federal government) you can find opportunities to try something new. The trick here isn’t to do something for novelty’s sake, but to see your favorite techniques as starting points, tweakable recipes. Delegating responsibilities across a team means having to adopt a collective mindset, an implicit understanding that more brains are better than one. This is true for design, too, in which subjecting concepts to multiple perspectives validates it. Through the “collective” mindset, then, you see opportunities to draw other people into the design process. Collective behavior: Divide and conquer. Find a way to involve other people in a normally solitary activity. In one project, my colleague realized all the user research data we gathered was too much for one person to analyze on their own. She organized a workshop in which every participant analyzed a slice of the data. Great collaboration finally depends on every participant having a voice, the freedom to express their opinions and offer critique. It depends on the ability to remain confident, even while team members, stakeholders, and clients subject your design to unmitigated criticism. Assertive people overcome their natural tendency to think their opinions aren’t important or their questions aren’t relevant. Assertive behavior: Say I don’t know. It’s easy to let your ignorance slide, rolling right past a misunderstanding or making up excuses for gaps in your knowledge. 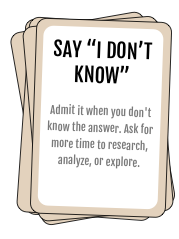 By saying “I don’t know,” however, you assert that you need more information, and that you don’t always have the answer. Collective: You acknowledge that other people can help you make your ideas better. Assertive: You don’t wait for people to come to you. Humble: You acknowledge that your ideas aren’t genius nuggets showering down on humanity. If the suggested behaviors for one or more of these mindsets feel uncomfortable, you’re not alone. They may run against the grain of your personality. You may be the kind of person who has trouble speaking up in meetings or prefer to keep your work to yourself until the last possible minute. You may loathe asking too many questions, or become defensive about unsolicited design feedback. If you’re too quiet, or reserved, or defensive can you be a successful designer? The cost of collaboration increases if your instincts lead to counterproductive behaviors. Storm out of one too many meetings, and the ultimate cost is that people don’t want to work with you. Rigid? Solitary? Passive? The ultimate cost of behaviors stemming from these mindsets is that people don’t want to work with you. Overcoming these instincts is, I believe, part of growing and becoming better at what we do. Even those people for whom these behaviors come naturally have to work to channel their efforts. Assertive people can share too much, dominate conversations, and speak out of turn. Curious people can bog down processes, chasing lines of questioning that distract too much from goals. Far be it for me to suggest you change your mindset. You developed these lenses for a good reason, and they’ve likely served you well in other parts of your life. I doubt I’ll ever have a Collective mindset, preferring, as I do, to sit hunched over my desk, doodling or writing, lost in my own thoughts. Design work depends on coming up with great ideas and working frictionlessly in high-conflict situations. But I’ve come to understand, as perhaps you have, that I can be my own worst enemy when it comes to getting stuff done. Work in design places certain demands on the people participating. Those demands include coming up with great ideas and working frictionlessly with other people in high-conflict situations. If you, like me, wonder why you sometimes stumble, you need to understand how mindset works. Recently, my partner Nathan critiqued an approach I was using. I could feel the defensiveness rising inside me. With most things, I have a pretty thick skin, but with a few aspects of my work I can’t bear to hear criticism. My mindset worked against me, and I perceived Nathan belaboring minute points, and I felt angry. Reality, however, was much different from those perceptions and feelings. Nathan was just doing what we do: Providing constructive feedback to each other. Part of me understood that my emotional reaction was due entirely to my psychological baggage, and not what Nathan was saying, so I held my tongue. While mindsets appear as behaviors, they are ultimately a lens for looking at and interpreting the world around you. Mindsets don’t dictate particular behaviors, but instead help you make a choice about how to behave. Mindsets suggest a choice about how to behave, and sometimes you need to choose a different behavior. You can choose to behave in a certain way without its being your natural instinct. If, for example, you’re the kind of person who doesn’t like sharing your work in early draft form, you can still choose to do that, even if the mere thought of it gives you anxiety. My reaction to Nathan’s critique was to shut down and end the conversation, but instead I forced myself to ask him questions. Through your mindset you look at the world in a certain way, form an opinion about it, and then make a choice about your behavior. At each stage, you have an opportunity to short-circuit your natural tendency. Perceive, feel, choose, act. You have an opportunity to short-circuit your natural tendency at each stage. For example, if you have a Solitary mindset, you might perceive that an assignment is your chance to prove yourself. You feel an obligation to fulfill the assignment on your own, so you choose to iterate on your work without sharing it with other team members until it’s perfect. But once you recognize these things, you can change your behavior. You can still have the perception (chance to prove yourself) and the feeling (obligation to fulfill the assignment solo) and you may even make a choice about how you will act on those feelings. But you can stop short at the choice, and behave in a way that’s better for the project, even if it doesn’t come naturally. Even if it’s uncomfortable. Sharing draft work may feel unnatural, even after you’ve done it several times, but it leads to better products. How do I perceive the situation? What aspects of the situation loom large? What don’t I see in this situation? What’s happening behind the scenes? What type of discomfort am I feeling? Is it anxiety or frustration or shame? What aspect of the situation made me feel this way? What’s my instinctual reaction? Why do I want to respond in this way? If I were someone else, how would I respond? It’s not easy to ask these questions in the moment, but knowing they’re there gives you a chance to avoid responding off the cuff. If your aim is to move the project forward while still enjoying your work, that small moment can mean the difference between productive conflict and more wasted time. It’s that small moment that allows us to overcome the instincts that stand in the way of our best work. 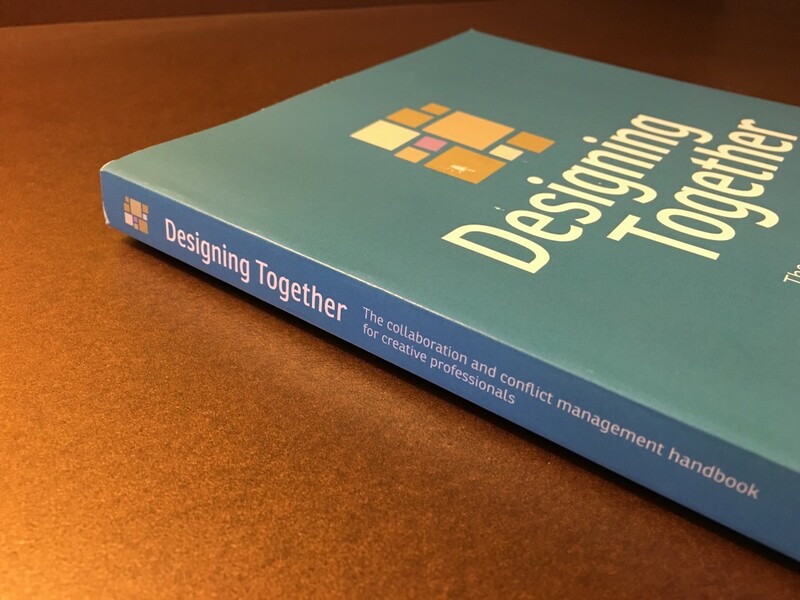 Team dynamics, collaboration, and conflict are the subject of my second book, Designing Together. You should totally buy a copy! Looking for a fun way to practice your conflict management skills? Pick up a copy of my card game for design teams, Surviving Design Projects. EightShapes can work with your team to help with your most challenging design problems.